Objective. Retrospective single-centre analysis of growth characteristics in 182 healthy short children born small for gestational age (SGA) or appropriate for gestational age (idiopathic short stature, ISS). Methods. Birth size references from the USA and Sweden were compared, and for the classification as SGA or ISS the Swedish reference was chosen. Height, target height (TH), bone age (BA), predicted adult height (PAH), IGF-I and IGFBP-3 values were compared between SGA and ISS. Results. In the combined group, birth weight and length showed a symmetric Gaussian distribution. The American reference overestimates the percentage of short birth length and underestimates that of low birth weight. In childhood, SGA children were shorter than ISS (−3.1 versus −2.6 SDS, ), also in comparison to TH (−2.6 versus −1.9 SDS, ). TH, height SDS change over time, BA delay, and PAH were similar. IGF-I and IGFBP-3 were lower in ISS ( and .09). Conclusions. SGA children represent the left tail of the Gaussian distribution of birth size in short children. The distinction between SGA and ISS depends on birth size reference. Childhood height of SGA is lower than of ISS, but the other auxological features are similar. The evaluation of growth is an essential part of the diagnostic work-up of children attending the pediatrician's practice, particularly children referred for short or tall stature. Based on a thorough medical history together with a physical examination and various characteristics of the growth pattern, followed by a laboratory screening, the pediatrician estimates the probability of a pathological cause. With respect to growth characteristics, we have recently reported an evidence-based guideline for referring patients to a pediatrician including information on birth size, height and parental target, as well as growth faltering (deflection). This guideline has a good sensitivity to detect pathology, at a low percentage of false negatives . However, only in approximately 5% of short children can a pathological cause be detected . Short children in whom no pathology can be found are then subdivided into short children born small for gestational age (SGA) and children born with a normal birth size but becoming short in infancy and childhood (idiopathic short stature, ISS). There is consensus among pediatric endocrinologists about the definitions of SGA  and ISS [4, 5] but it has also been argued that the distinction between the two diagnostic categories is arbitrary. The distinction between SGA and ISS is based on birth weight and birth length SDS (SGA if birth weight and/or length ) and the availability of these data and the choice of the reference influence the diagnostic label. Another issue in the diagnostic classification is the way ISS can be subcategorized. In the report of a consensus workshop , confirmed at a recent ISS consensus meeting , ISS was divided into familial short stature (height SDS close to the parental target height) and nonfamilial short stature (height below the target range). For this distinction, there is uncertainty about the proper cut-off, as there are many formulas to calculate target height [6, 7]. Both subgroups can be further subdivided into children with normal or delayed puberty. It is assumed that bone age delay is not a reliable diagnostic criterion for constitutional delay of growth and puberty , but there are no data about bone age delay in the various subgroups of ISS. In this study, we first aimed at investigating the impact of the use of different references of birth weight and length for gestational age [8, 9] on differentiating SGA and ISS in a well-characterized cohort of short children collected in a single large growth centre. Secondly, we aimed at comparing auxological and biochemical characteristics of SGA and ISS. Thirdly, we investigated bone age delay in the two subcategories of ISS based on distance to target height. We collected a group of 182 short (height 2 SDS) but otherwise healthy prepubertal children who presented between mid 2002 and mid 2005 at our pediatric endocrinology outpatient clinic and who were regularly seen for follow-up. They were older than 3 years at recruitment for the study. Very preterm birth ( 30 weeks of gestation) and serious complications postnatally (ventilation 72 hours) were exclusion criteria, as well as chronic diseases that might interfere with height development such as asthma, chronic diarrhea, celiac disease, endocrine disorders (e.g., growth hormone deficiency), congenital malformations, known syndromes, chromosomal aberrations, and abnormal body proportions. Informed consent was obtained from the parents and the patient. The study was approved by the Medical Ethics Committee of the University of Tübingen. Birth data were obtained from the yellow preventive health care check-up booklet that every German child receives at birth. Based on the established definition of SGA (birth weight and/or weight −2 SDS) and using the 1981 Swedish reference data , 45 children were diagnosed as SGA and the remaining 137 children as ISS. Birth weight and length were available for all 182 patients, and birth head circumference in 126 of them. For the analysis of height in childhood, the height measurements carried out at our outpatient clinic at inclusion in the study were used ( ). For children who subsequently received growth hormone (GH) treatment, the last measurement before the start of therapy was used. For all children, we searched—either from the yellow booklet or from a visit to our outpatient clinic—for an additionally documented height measurement (at least 0.5 years, but preferably between 1 and 3 years before the measurement at inclusion), so that there would be a sufficient time span between the first and the second measurements for assessing growth rate. Suitable measurements were found to be documented in 77 patients. Out of the total cohort of 182 children, data on target height, bone age, and plasma IGF-I and IGFBP-3 were available in 114 children. For 57 children, the predicted adult height could be calculated. Birth weight (BW), length (BL) and head circumference (BHC) were expressed as SDS using Swedish reference data reported by Niklasson et al. (NIK)  or Usher and McLean (UML) , and the discrepancies between both values were assessed. Postnatal height in childhood and adolescence was expressed as SDS for Swiss references , which is representative for this South-West German population. Target height was calculated according to Hermanussen and Cole  and expressed as SDS . Below target range was defined as HSDS – THSDS 1.6. Bone age was assessed according to Greulich and Pyle  and Predicted adult height minus target height was analyzed according to Bayley and Pinneau . IGF-I and IGFBP-3 values were expressed as SDS for the references according to Blum [14, 15]. The student's -test was used to assess differences between groups. Fisher's exact test was used to analyze contingency tables. Target height was analyzed with the one-sample- -test. Table 1 shows data on gender distribution, gestational age (GA), and age and height at inclusion into the study of the total cohort as well as children classified as ISS and SGA. The mean GA was similar between groups. The rate of prematurity (GA 37 weeks) was lower in the ISS group than in the SGA group ( ). Auxological parameters of the total cohort at inclusion. Height SDS was calculated based on Prader et al. . The median and range values for the three different birth parameters BW, BL, and BHC are listed in Table 2 for the whole group and the ISS and SGA groups separately, according to the two references. In the whole cohort, birth weight SDS according to NIK tended to be lower than according to UML ( ), but birth length SDS was higher ( ). Head circumference SDS tended to be higher according to NIK than UML ( ). Anthropometric data at birth: SDS (median and range) comparing the references of Niklasson et al. and of Usher and McLean . BW = birth weight. BL=birth length. BHC = birth head circumference. The distribution of birth weight and birth length SDS in the whole group is shown in Figures 1(a) and 1(b). Both histograms show a Gaussian distribution, suggesting that SGA of unknown origin can be considered as the left tail of the normal distribution of birth size in short children. This is further illustrated by the plot of birth length SDS versus birth height SDS for the whole cohort (Figure 2). Distribution of birth weight SDS (a) and birth length SDS (b) for the whole cohort(n = 182). Mean (SD) birth weight = -1.09 (1.15), mean (SD) birth length = -0.88 (1.40). Dark areas signify SGA cases. 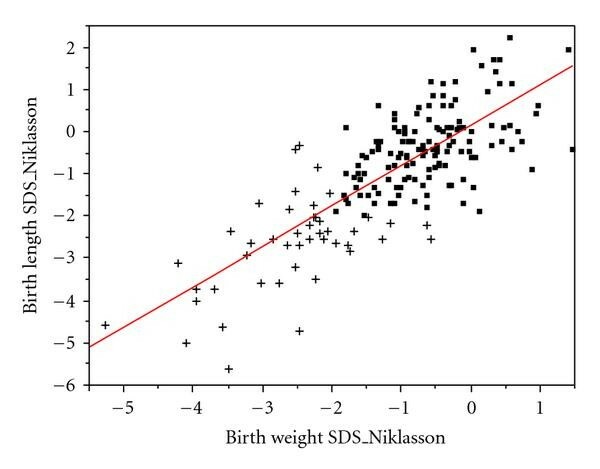 Birth length SDS versus birth weight SDS according to Niklasson  in all patients(n = 182). SGA children are indicated with crosses and ISS children with squares. R2 = 0.61. Table 3 shows the classification of the cases into SGA and ISS on the basis of a BW and/or BL of less than 2 SDS according to the two references. According to NIK, 45 of the 182 patients (24.7%) are classified as SGA, with a homogeneous pattern of smallness for weight and length. In contrast, with the UML reference, 48 (26.4%) children are classified as SGA, with a large majority being short for gestational age. Forty one patients are classified as SGA according to both references. Birth weight (BW) and length (BL) of short children classified as SGA based on the references of Niklasson (NIK)  and Usher-McLean (UML) . Head circumference data at birth are available for 126 patients. According to NIK, 14 patients (13 SGA, 1 ISS) had microcephaly at birth, defined by a BHC of less than 2 SDS (11% of the cohort). According to UML, 30 patients (23 SGA, 7 ISS) were microcephalic (24% of the cohort). Table 1 shows auxological data for the whole cohort, and ISS and SGA separately. Children with ISS were slightly older than children with SGA ( ). The younger age of SGA patients can be explained by early start ( 5 years) of growth hormone (GH) in 9 cases. The median height SDS of the SGA group around 8 years was significantly lower than in the ISS group ( ). The distribution of the height SDS of the whole cohort at inclusion is shown in Figure 3(a). As expected, the form of this histogram resembles the left tail of the Gaussian distribution. Histograms of the distribution of: (a) Height SDS at inclusion.N = 182 (137 ISS, 45 SGA). Median (range) = −2.51 (−5.18 to –2.00); (b) target height SDS. N = 114 (93 ISS, 21 SGA); (c) height SDS minus target height SDS with cut-off of −1.6 SDS indicating target height range. 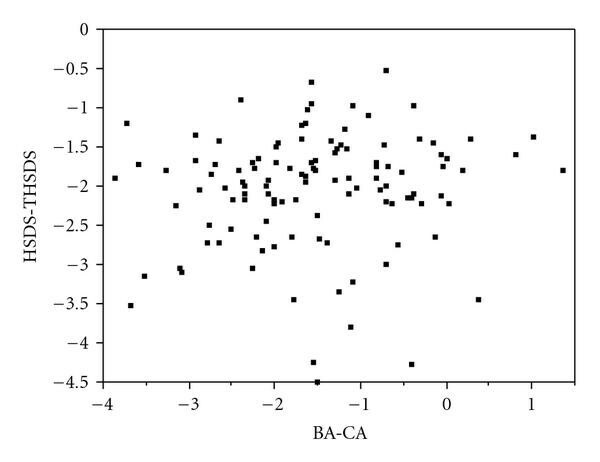 N = 114 (93 ISS, 21 SGA); (d) distribution of bone age delay (BA-CA) in years. N = 114 (93 ISS, 21 SGA). In the children with longitudinal measurements ( ), the change in height SDS between the two time points (T1 was taken between 1.2 and 11.6 years, T2 between 3.1–13.1 years) was close to zero, and even tended to be positive (0.08 SD/year). It was not statistically different between ISS and SGA ( ). For analysis of the additional parameters, 114 patients were available, with a similar height SDS as in the total group, but a slightly different composition (82% ISS instead of 75% in the complete cohort) (Tables 1 and 4). Auxological and biochemical data for all 114 patients, and ISS and SGA separately, are shown in Table 4. Target height (TH) is presented in Table 4 and its distribution is shown in Figure 3(b). For both groups, TH SDS was significantly below the population mean (ISS , SGA ). Height SDS was approximately 2 SD lower than TH (Figure 3(c)). The difference between height SDS and TH SDS was more in SGA patients than in ISS ( ), but the number of patients below a cut-off of –1.6 SDS (the lower limit of the target range) was similar (81% and 73%, resp.). Auxological and biochemical parameters of patients with available target height, bone age, and biochemical data. Mean (SD) are shown, except when indicated otherwise. The distribution of the difference of bone age minus chronological age ( ) is shown in Figure 3(d) and mean (SD) values are shown in Table 4. Bone age delay was similar in ISS and SGA patients, but there were more ISS children with a bone age delay 1.6 year (54%) than SGA children (24%) ( ). Mean (SD) values for predicted adult height (PAH) SDS ( ) are shown in Table 4. Mean PAH SDS was −1.83, 1.2 SD lower than TH. The percentage of children with ISS who had a PAH SDS below the target height was lower than that of children with SGA ( ). Many clinicians assume that children with familial short stature have less bone age delay than children with non-familial short stature, some of whose may later turn out to have constitutional delay of growth and puberty. However, when analyzing the distance between height SDS and target height SDS against bone age minus chronological age, no correlation was observed (Figure 4). Difference between height SDS and target height SDS plotted versus bone age delay (bone age minus chronological age) in children with ISS.R2 = 0.01. N = 114 (93 ISS, 21 SGA). Table 4 shows that IGF-I was significantly lower in ISS than in SGA ( ). For IGFBP-3, the difference did not reach statistical significance ( ). IGFBP-3 tended to be higher in girls (median of 0.71 versus 0.3 in boys, ). We have shown that children with SGA represent the left tail of the Gaussian distribution of birth size in short children. The choice of the birth size reference has a considerable impact on the distinction between the diagnostic labels "short child born small for gestational age" (SGA) and "idiopathic short stature" (ISS). The asymmetric distribution for birth weight and birth length suggests that the UML reference for birth length is too high and for birth weight too low. This is not surprising, as the 1969 American reference was only based on 300 cases, not even sufficient to prepare separate charts for boys and girls , while the relatively recent Swedish reference  was based on 475,000 babies. Mean height of children born SGA is lower than ISS, but the other auxological features (TH, height SDS change over time, BA delay, PAH) are similar between the two groups. IGF-I SDS was lower in ISS than in SGA, and considerably lower than IGFBP-3 in both groups. The important consequences of the choice of the birth size reference for the diagnosis SGA should be born in mind if one judges the results of studies on the natural history of SGA, or the effect of growth hormone treatment. In particular, the birth length UML reference chart seems to be far too high, so that what would appear a small length for gestational age is often normal for present day western babies. Our finding, that using the UML charts for head circumference doubles the incidence of microcephaly in comparison to the NIK reference charts, is an indication that the UML reference is also inferior on that measure. Comparing growth characteristics of children labeled ISS or SGA, mean height SDS of children born SGA is approximately 0.5 SD lower than that in ISS. This finding is compatible with previous reports on the association of birth weight with stature in childhood [16–21]. The distance between height SDS and target height tended to be greater in SGA (2.6 versus 1.9 SD), which can be explained by the notion that part of the children with ISS fall into the category of familial short stature (height SDS within the target range). Other auxological features, such as the target height itself, height SDS change over time, bone age delay, and predicted adult height, are remarkably similar between both diagnostic categories. 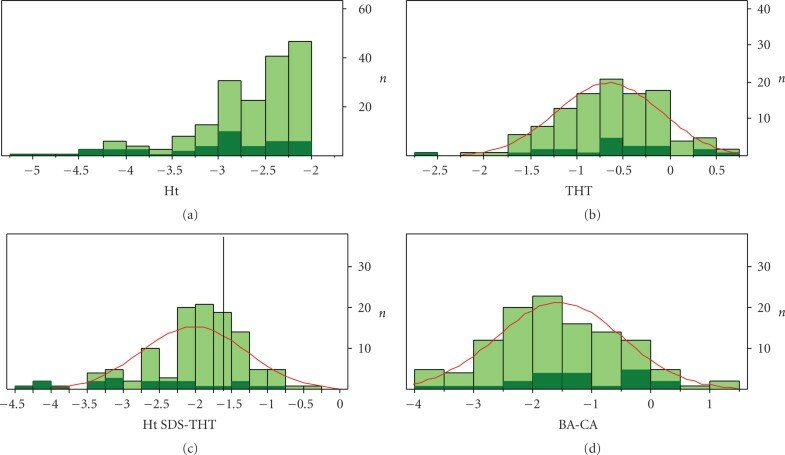 In combination with the symmetric Gaussian distribution of birth weight if ISS and SGA are combined, this confirms that the distinction between SGA and ISS is arbitrary. In the workshop report on the definition of ISS , it was proposed to subcategorize ISS into two subgroups: familial short stature (FSS) and non-familial short stature. This was recently confirmed by a consensus meeting  (although not unanimously), and by the ESPE Classification of Paediatric Endocrine Diagnoses . We have previously emphasized that also this subcategorization is an arbitrary one, and dependent on the choice of the target height formula . In the present study, we show that if the target height formula by Hermanussen and Cole  is used, approximately 75% of the ISS and SGA patients have a height below the lower limit of the target range (TH SDS minus 1.6). These arbitrary subgroups have a similar bone age delay, so either bone age delay is not a good marker of familial versus non-familial short stature or the routine Greulich-Pyle ratings were too inaccurate to reflect the differences. While one may expect that part of the children with non-familial short stature may enter into puberty late, and can then be diagnosed as "constitutional delay of growth and puberty", the predictive value of bone age delay for delayed puberty is uncertain. In line with earlier observations [24–27], average plasma IGF-I is low in ISS and SGA, and the percentage (21%) of low values ( 2.0 SDS) is similar to percentages found previously. Remarkably, average plasma IGFBP-3 levels are normal. This combination would suggest that cases of mild GH deficiency or resistance are rare, but that disorders at the level of GH signal transduction, causing a selective inhibition of IGF-I rather than of IGFBP-3, may be involved in short stature. Another explanation is that IGFBP-3 is less dependent on the biological action of GH than IGF-I [28–30]. In conclusion, birth size should be assessed with a recent and reliable reference chart; the Usher and McLean data should no longer be used as reference data. Children with SGA form the left tail of the distribution of birth weight in short children and auxological and biochemical characteristics of children with SGA and ISS are similar. In familial and non-familial short stature, there appears to be a wide variation in bone age delay of similar magnitude.